While it is relatively easy to specify reference planes and landmark points for AC-PC and Talairach transformation, the interactive, manual procedure is subject to individual interpretations of the position/orientation of reference points/planes that can lead to specifications on slices that deviate a few millimeters when performed by different researchers. Even if the same researcher performs these definitions repeatedly on the same brain, small deviations are typically observed. Most importantly, the definition of landmarks such as the anterior and posterior commissure requires sufficient neuroanatomical knowledge and anatomical data of sufficient quality to identify landmarks. An automatic procedure is beneficial not only to save time but it may also lead to a consistent definition of landmarks. There are two major volume-based approaches to achieve a "normalized" (Talairach or MNI) brain space. In the explicit landmark definition approach, the user needs to define reference planes and points on images of a measured brain (native space) and the transformation is performed, usually in two steps (AC-PC step, cerebrum border step) without referring to a atlas or template brain. In the template brain approach an automatic procedure transforms the measured brain in native space to match the orientation and size of a target (template) brain. This procedure uses linear transformations (scale, rotation, translation) resulting in a global match but it may also include non-linear transformations to improve alignment locally to some extent. The implemented automatic AC-PC / Talairach transformation in BrainVoyager QX v2.4 follows closely the steps that are performed in the interactive, manual approach. A template-based approach is scheduled for a later release. In the original definition (Talairach & Tournaux, 1988), the midpoint of the anterior commissure (AC) is located first, serving as the origin of Talairach space (i.e., the AC point has value 0 for the coordinates in all 3 spatial dimensions). The brain is then rotated around the new origin (AC) so that the posterior commissure (PC) appears in the same axial plane as the anterior commissure. The connection of AC and PC in the middle of the brain forms the y-axis of the Talairach coordinate system. The x-axis runs from the left to the right hemisphere through AC. The z-axis runs from the inferior part of the brain to the superior part through AC. In order to further specify the x and z-axes, the y-z plane is rotated around the y (AC-PC) axis so that it separates the left and right hemisphere, i.e. it defines the mid-sagittal plane. This completes the first part of Talairach transformation, often called AC-PC transformation. The obtained AC-PC space is attractive for individual clinical applications, especially presurgical mapping and neuronaviagation since it keeps the original size of the brain intact while providing a standard orientation for a subject's brain. The automatic procedure operates in a slightly different order than the interactive procedure. It first determines the mid-sagittal plane. The mid-sagittal plane (MSP) is important since it allows deriving rotation angles that put the brain into sagittal orientation. Furthermore, the MSP contains the fundamental landmarks of Talairach space, AC and PC, connecting the left and right hemisphere. The automatic detection of these small landmarks is, however, difficult and the automatic procedure, thus, first attempts to find anatomical structures that are more easy to detect including the corpus callosum and the Fornix (see snapshots above). Note that the AC point in the MSP is very close to the lower tip of the Fornix and that the Fornix is easy to find if one knows the location of the corpus callosum. In order to see how the program performs in finding anatomical structures, the "Visualize intermediate results" option can be turned on in the "Talairach" tab of the "3D Volume Tools" dialog; with this option on, intermediate results of the automatic procedure will be shown in the new "Image Reporter" (for details see the updated User's Guide). To detect the PC point, the brain stem is segmented since the posterior commissure is superior to the dorsal posterior part of the brain stem. The initial AC and PC points are further refined by local search procedures. The detected MSP, AC and PC points are then used to perform the AC-PC transformation step resulting in a AC-PC aligned VMR file. For a full Talairach transformation, a bounding box (cuboid) is defined in AC-PC space that runs parallel to the three axes defined in the first step enclosing precisely the extent of the cortex (grey matter). 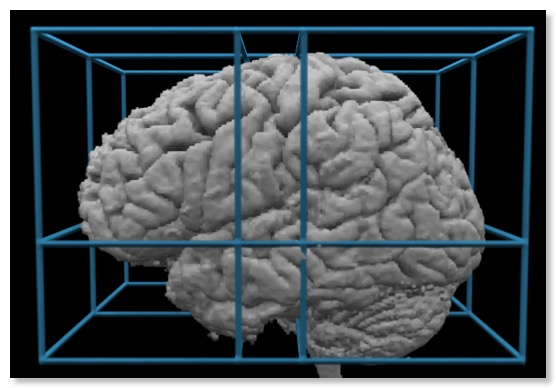 This cuboid or bounding box requires specification of additional landmarks at the borders of the cerebrum. The bounding box is sub-divided by several sub-planes. The mid-sagittal y-z plane (determined in the previous step) separates two sub-cuboids containing the left and right hemisphere, respectively. An axial (x-y) plane through the origin separates two sub-cuboids containing the space below and above the AC-PC plane. Two coronal (x-z) planes, one running through AC and one running through PC, separate three sub-cuboids; the first contains the anterior portion of the brain anterior to the AC, the second contains the space between AC and PC and the third contains the space posterior to PC. These planes separate 12 sub-cuboids. In a final Talairach transformation step, each of the 12 sub-cuboids is expanded or shrunken linearly to match the size of the corresponding sub-cuboid of the standard Talairach brain. To reference any point in the brain, x, y, z coordinates are specified in millimeters of Talairach space. Talairach & Tournoux (1988) also defined the proportional grid to reference points within the defined cuboids. The automatic procedure determines the borders of the cerebrum by segmenting the brain in several axial and coronal slices on which the most extreme borders of the calculated segments are determined. A comparison across several neighboring slices is used to avoid outliers, i.e. slices where the segmentation did not work as desired; these slices may still contain non-brain tissues such as meninges that would lead to wrong cerebrum border estimations. 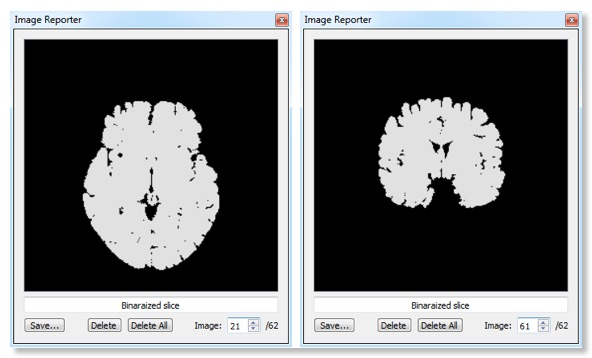 The snapshots above shows 3 segmented slices where the segmentation works as desired, an axial slice (image no. 21), a mirrored half coronal slice (image no. 42) and a coronal slice (image no. 61). The final border points are estimated in the transformed AC-PC (VMR) data set with small adjustments that take into account intensity gradients and partial volume sampling. Finally the Talairach normalization step is applied to the AC-PC VMR file resulting in an output file in Talairach space. While the automatic procedure usually works very well, there may be cases that do not work as expected. In these cases it is rather easy to "help" the automatic procedure by correcting the position of landmarks. For details, see the User's Guide of BrainVoyager QX 2.4 or later. 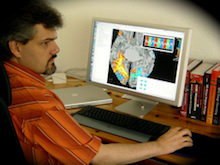 In this web log Rainer Goebel provides information about his design and programming work on the BrainVoyager product family.